Downloading and managing installation media is not fun. 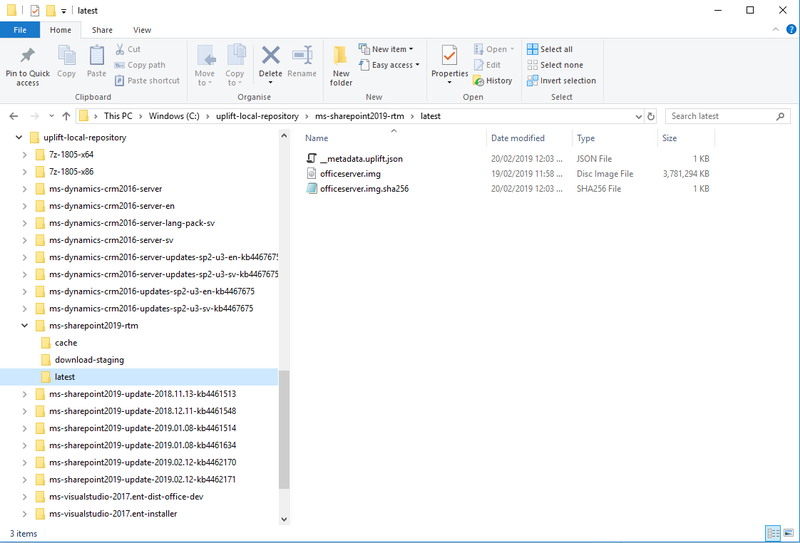 Whether it is development, test or lab environment, dozens of ISO images, patches, updates and language packs have to be downloaded prior to setting up you SharePoint, SQL or even bare Windows setup. Sometimes, it might be up to fifty files to move around! Getting started is super-easy. Just grab the latest InvokeUplift module from the PowerShell gallery. Note that pwsh should be used all the time as this is a PowerShell 6 module. There more tools available, such as HashiCorp’s Vagrant and Packer, ReSharper, and more — just play around. By default, files are downloaded with checksum verification. Assuming that the first download was successful, consequent downloading won’t download anything. That makes the downloading experience not only fast but also predictable — files are downloaded rightly, without being dropped in the middle. Initially, file is downloaded into /download-staging folder. If checksum passes, then the file is moved into /latest folder. Such stages download workflow prevents incorrectly downloaded files overwriting, corrupting current “latest”. Only checksum validated files make it forward. These files provide a machine-readable input so that external tools can consume and validated downloaded files. As you can see, while invoke-uplift does not solve all the problems, it surely solves one problem nicely. Initially, we struggled with file downloading while building golden images for our development and integration environments. Downloading and managing installation media was a manual, boring and error-prone process. Nowadays, invoke-uplift is an important part of several other projects — Packer images and Vagrant boxes for SharePoint engineers. Every single bit is under CI/CD pipeline, complexity is covered and exposed via single line command, we almost forgot how to download things via browser, and so should you! Moreover, invoke-uplift works under MacOS streamlining Windows/Macbook experience. If you find this useful, drop us a line or give feedback on the GitHub. We always keen to learn more and improve on the feedback. Easy SharePoint automation for developers and engineers. Provision SharePoint artifacts and deliver SharePoint infrastructure with confidence, sanity and joy. Easy SharePoint automation for developers and engineers.